After delicious chocolates and other sweet treats that Valentine’s Day brings, here’s your reminder to keep up with your oral care routines. These sweet treats will not only linger in your home but also in between your teeth and gums. Protect your teeth and gums with a toothpaste that has extra protection to combat these sweet treats. My favorite part of Valentine’s Day has always been the chocolate. Any and all chocolate! My kids have a similar sweet tooth and received some Valentine’s Day candy and chocolate as gifts. It is super important our house is stocked full of the right brand of toothpaste! Do you know what I love even better than chocolate and sweets? A great deal! 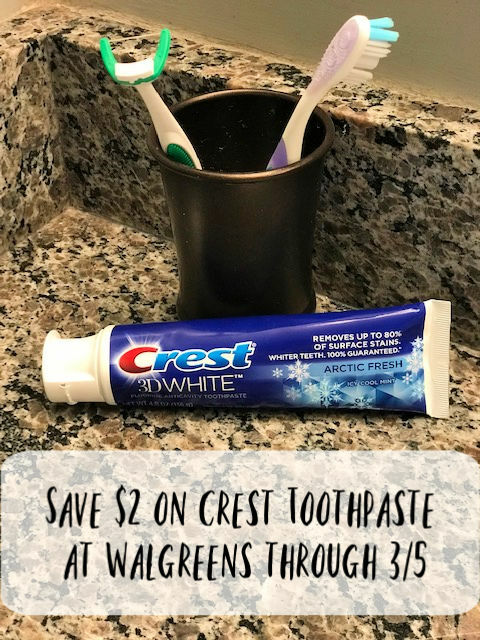 Right now there is a fantastic $2 coupon you can use at your local Walgreens store to stock up on Crest toothpaste. This coupon can be found at Walgreeens.com starting on February 27, 2019 through March 5, 2019. This eSaver coupon is valid when you purchase any Crest toothpaste ($2.99). After coupon, you will pay just $0.99 for your Crest toothpaste. 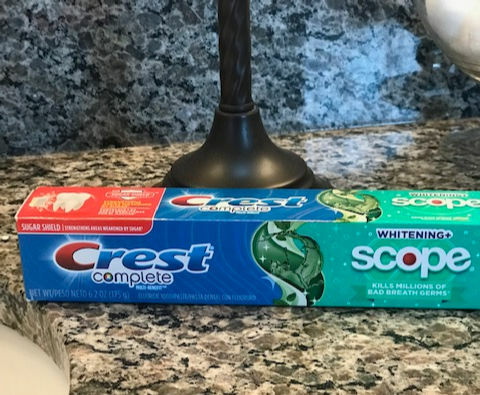 I suggest using the $2 coupon on either Crest Complete Whitening Plus Scope or Crest 3D White Arctic Fresh. These are two of my favorite Crest products that whiten teeth by removing surface stains. Brighten your smile with Crest 3D White Arctic Fresh Whitening Toothpaste. It whitens your teeth by removing up to 80% of surface stains and protects against future stains, for a noticeably whiter smile. 3D White fluoride toothpaste also strengthens your tooth enamel and helps protect against cavities. It also provides an Arctic, Cool burst of freshness that lasts after brushing. What is your favorite Valentine’s Day treat? Is your bathroom stocked up with your favorite Crest products?